The sooner you write an apology business letter after an infraction, the better. 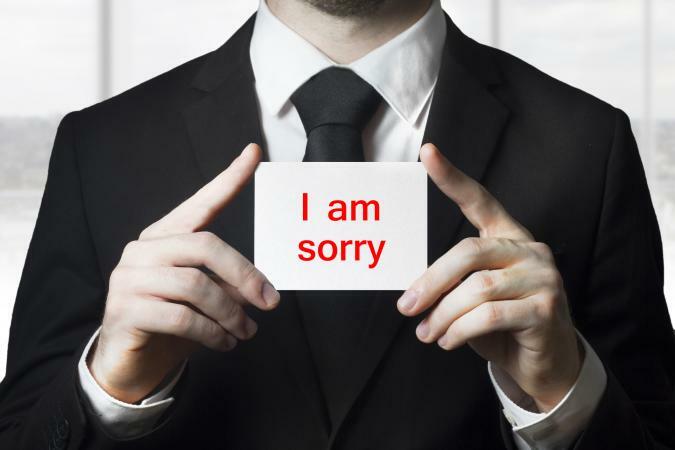 If you've committed a business offense of some kind, extend an apology shortly thereafter. Acting quickly can make the difference between saving or ending a business relationship. Access the template that most closely matches your situation by clicking the image. 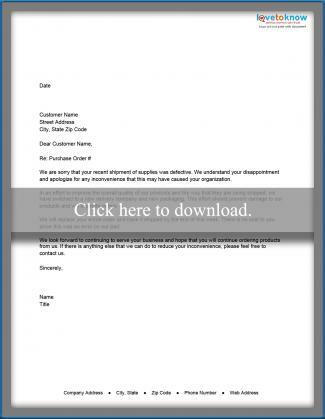 It will open as a fully customizable PDF document that you can edit to meet your needs. Then, simply save and print. See this guide to working with printables if you need assistance. 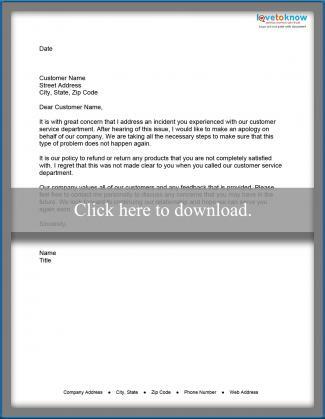 Use this template if you need to draft a letter apologizing for unsatisfactory customer service. Use this template if you need to apologize to a customer who has received a shipment that has been damaged. Use this version to write an apology letter for missing a meeting that you should have attended. Once you have opened the template of your choice, click anywhere in the document to edit. You can use as much or as little of the sample letters as you'd like in your version. Use the menu commands on the toolbar to save and print the finished document. Of course, there are additional reasons you might need to apologize to an individual or organization with whom you do business. If the templates above don't quite meet your needs, the wording in one of the following sample letters might help. Accounting mistake: If you need to respond to a customer who has pointed out a mistake on his or her account, this sample letter outlines appropriate language for an apology. Order cancellation: If a problem with your company caused a customer to cancel an order, you may want to send a letter based on this sample to apologize for the issue. NSF check: If you sent a vendor a check that was returned for insufficient funds in error, consider using this text as a starting point for writing an apology. Start by saying you are sorry. You want the intent of the letter to be clear. Next, offer an explanation regarding the reason for the letter. Acknowledge what went wrong and how you plan to rectify the situation. Along with extending the apology in a timely manner, be sure to promise you won't repeat the offense. At the end of the letter, apologize one more time and mention you value the business relationship. Usually, if you acknowledge you've made an error in judgment or were wrong in some fashion and express your regret sincerely, the person receiving the letter will forgive the infraction and continue to do business with you. However, sometimes it takes more than words, and an apology letter must be accompanied by appropriate restitution to repair your business relationship. Consider the specifics of the situation when deciding what - if any - restitution may be required to provide appropriate and effective customer service. Type the apology using a common, easy-to-read font such as Times Roman or Arial. Print your letter on good quality white paper. Use a formal business letter format such as semi-block or full-block. Incorporate your apology within the beginning of your letter. Clarify the problem when you apologize to a customer. Outline what action you plan to take to rectify the problem. Review the letter to verify that it accurately conveys the message. Proofread closely, carefully checking for and correcting errors. Ask someone else to proofread before finalizing, making any necessary adjustments. Save the final version of the letter. Sign the letter by hand before mailing. 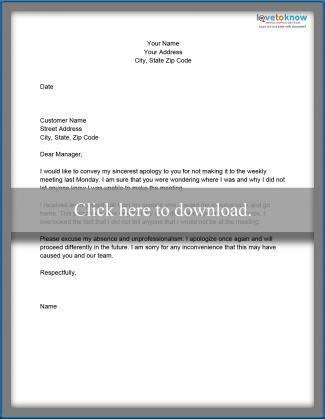 Place a copy in the customer's file, keeping a notation of when it was sent. While it is prudent in most cases to write and send your apology letter with a quick response, there are times when it is best to wait. For example, if the incident in question may result in legal action or liability issues, it is best to talk with legal counsel before you put anything in writing. Maintaining healthy business relationships sometimes requires an apology. Sending an apology letter can show the offended party you not only realize you were wrong and accept responsibility for what happened, but you also value the relationship. Saying you're sorry can save business relationships and disperse the problem before it gets out of hand.